WHILE MANY OF us are familiar with the extravagant Christmas markets on offer across Europe, those on our own doorstep deserve equal recognition. With dozens of markets taking place around the country in the run up to the 25th, there’s something for everyone to enjoy – even if you’re more like Scrooge than Buddy the Elf. Running over two weekends, the Dublin Christmas Flea Market will host more than 140 different stalls each weekend. No two stalls will be the same, with Irish-based start-ups, artists, designers and collectors filling Point Square for the event. From up-cycled cocktail glasses made from Dublin’s pub waste to jewelry made from 5,000-year-old bog oak, you won’t find offerings like these anywhere else. From a festive light show to an igloo stage, Winterval has it all. 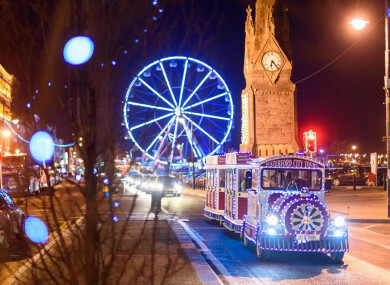 Take a ride on the express train, hit the ice rink and enjoy a hot chocolate at the Christmas market for a day out that all members of the family will never forget. Find more information on event times here. When: Every Friday from 5pm-9pm, Saturday from 2pm-7pm and Sunday from 2pm-7pm until December 23. Recently opened on the grounds of Slane Castle, Slane Distillery has been transformed into a Christmas village this December. A selection of giftware, local artisan produce and locally produced confectionery will be available from traditional log cabins, while food trucks will keep hungry stomachs satisfied. If you fancy a tipple, spiced apple punch and cocktails will be available too. With an ice tunnel, Ferris wheel, a North Pole scene and a children’s carousel to name but a few of the attractions at Glow, you might need to visit more than once to soak it all in. There’s also a Christmas food market, as well as carol singers and musicians. Find out times and more information here. Email “4 events for... Christmas market lovers looking for festive fun”. Feedback on “4 events for... Christmas market lovers looking for festive fun”.